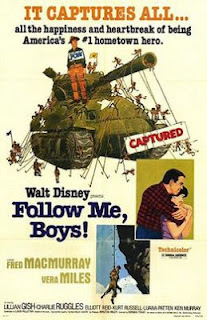 Disney Film Project: Disney Film Project Podcast - Episode 112 - Follow Me, Boys! Disney Film Project Podcast - Episode 112 - Follow Me, Boys! This week the DFPP team travels back in time to talk with Fred MacMurray about his own adventures in time travel and learns that sometime a little Hickory goes a long way when the old MacMurray is around in the 1966 drama Follow Me, Boys! 1. A cheap gimmick? Really?! Who's idea was this? I'm really disappointed. 2. What ever happened to reviewing each Disney film chronologically? Isn't this the whole point of the site? I'm sorry you didn't like it. The person who we know for whom this is one of their favorite Disney movies will appear on podcasts, but always under an assumed identity - it is their gimmick not ours. I do feel that despite the gimmick of it that they contributed very well and did not only provide the gimmick. The chronological reviews were the original reason for the creation of this site by Ryan. However, and he's mentioned this a few times on our podcast and interviews elsewhere, what happens is that life gets in the way a bit. Also many of the Disney shorts are difficult to track down at times, or a movie is unavailable. That slows the process down greatly. Ryan has not abandoned this, and he still does it from time to time, it just goes a lot slower than he originally planned. The podcast was always independent of that rule. We just jump around as we see fit. Trying to align with movie releases and video releases as best as possible. Nic: Based on your feedback, I have suggested some changes. We are going to try and implement some of them. We are eventually working to move to wordpress so the blog will be better. I'm sorry you don't like the podcast. The next time I'm a guest on this very well done podcast my "cheap gimmick" will be disappointed podcast listener Nick Ramer. I will spend the entire podcast boo-hoo-ing about how sad I am about a podcast. I'll be sure to mention how my life was brought down because someone did an impersonation. I will make sure to cry in my Cheerios and then get really depressed we aren't doing the movies in order. Oh the humanity! I will then proclaim myself King of the Losers. I also might even try to go out and get myself a life. Oh the possibilities! To quote the duck from the other studio, "You're despicable". And it's Nic Kramer. I challenge both you, and Nick Ramer, to a duel. Leave me alone, Tom. Don't you have better things to do?